Move Matrix™ is an Advanced Joint Hydrator that provides scientifically advanced ingredients that work synergistically in the body to support healthy joints. Ideal for customers who want support for overall joint health and comfort. Provides the nutrients for joint repair and rebuilding as well as provides potent antioxidant support. BioActive Neocell Collagen™ Type 2: The key structural protein of joint cartilage. Hyaluronic Acid: ‘Natures moisturiser’ which controls tissue hydration and water transport in the body. When combined with glucosamine and chondroitin they form a gel-like substance that aids free movement and provides cushioning of the joint. Glucosamine, Chondroitin and MSM: This combination provides the building blocks that contribute to the formation of healthy connective tissue. 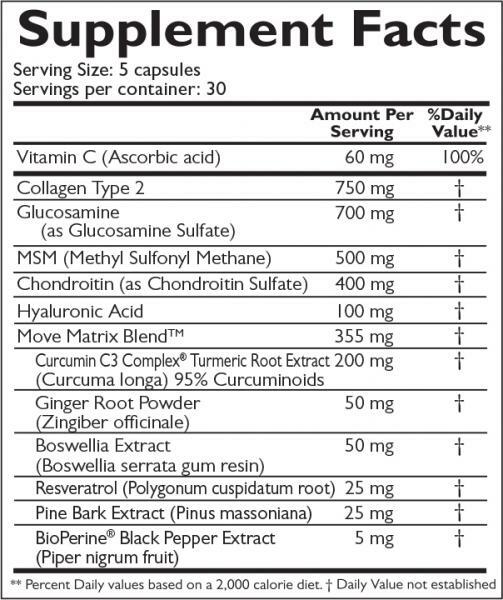 Move Matrix™ Blend: Contains a mix of herbal extracts and antioxidants. Dosage: Adults: 5 capsules daily. May be contra-indicated with blood-thinning medications and gastric ulcers. This is a fantastic product and I cannot rate it highly enough. I tore my meniscus in three places which is inoperable. The specialist surgeon advised that a knee replacement is the only option and that the pain would only worsen over time until the operation was completed. I was on crutches for 11 months. After three weeks of using this product I have absolutely zero pain and I am able to walk without crutches. It has now been 12 months and I still take this product every day and I am still pain free. I can run if I want and jump up and down but I am mindful that in the future I will need a knee replacement. This product is AMAZING!